Drop the dice and spice up your Settler’s of Catan or Cities and Knights games with this new set of cards. 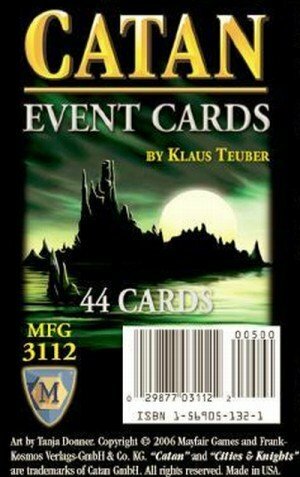 Featuring a 36 card set containing the numeric progression of two six sided dice, with many of the cards featuring events. Also included are 6 score keeping cards, the rules card and the reshuffle card. 44 cards. Drop the dice and spice up your Settler’s of Catan or Cities and Knights games with this new set of cards. The Catan Event Cards feature thirty-six cards that act as a deck of dice, replacing the need for dice in your Catan game. Special events are triggered by these cards each time they are turned over, adding an exciting new element to your Catan play. Also included are 6 score keeping cards, the rules card, and a reshuffle card. Great Fun! I very much enjoyed the Settlers of Catan Event Cards. The cards take the place of the dice and work very well. I really like the natural disasters (earthquake and plague) that can occur. It can really mess with planning and strategy but then cards like Year of Plenty gets played and it makes up for some of the bad stuff. Overall, it really didn’t seem to change how often the numbers were showing up but it does add a lot to the interactive part of the game.